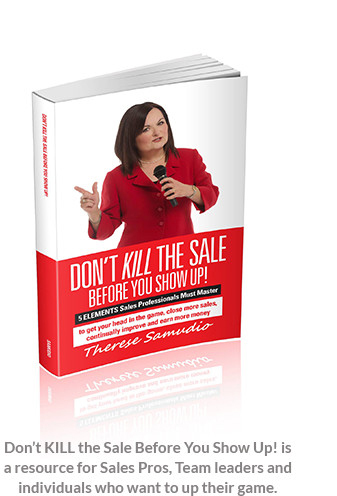 Therese Samudio, author of Don’t KILL the Sale Before You Show Up!, a B2B Sales Expert, works with individuals and teams who want to dramatically improve their sales and successfully grow their business. You will enjoy her enthusiasm and energy as she shares her field experience and knowledge. Known across the Country for her sales Quality and Consistency, Therese will help you confidently get there, too. She has accumulated a wealth of sales and business insights while having face-to-face sales interviews with more than 10,000 business owners all across America, while representing national management consulting firms, as well as a major CEO/Sales Leader peer group organization. According to Therese, whose extensive business background also includes producing, directing and appearing in hundreds of broadcast TV and video programs, as well as providing advertising, public relations, and special events services for 500 retail businesses in 13 shopping malls, "I really enjoy helping business owners, sales managers and sales pros with sales, management and life improvement – solid benefits available to AffirmativeSELLING!™ clients. Gotta love it." Therese sets your company on a path of continuous sales improvement – growth. She helps you to leverage your industry-specific skills and knowledge to a higher level of success now and in the future. Don’t Kill the Sale before you show up! Therese Samudio loves helping you sell better! You will enjoy her enthusiasm and energy as she shares her wisdom – developed during field experience while calling on more than 10,000 business owners all across America while she sold and taught hundreds of others to sell management consulting projects! Therese has found that while sales has changed a lot in the past couple decades many of the same sales problems and questions come up over and over. Her process, SuitUp!ShowUp!Sell!™ answers your questions and shows you how to make your own selling process self-renewing and self-updating. AffirmativeSelling™ is built to show you how to make Quality Sales Consistently™ ensuring Everlasting Sales Performance™. Known across the country for teaching sales teams and individual professionals to produce quality sales, consistently (without fear or drama), Sales Quality & Consistency Expert, Therese Samudio, will help you confidently get there, too. Are you up to it? Nothing motivates like knowing that what you’re doing will work and produce Quality sales, Consistently! No more slumps. No more “throw it against the wall and see shat sticks.” Stop guessing. Stop trying this and that. Not happy that you have to sell at all? You can lose your call reluctance and learn to love selling! If you’re leading a team, this is for you. Even the most experienced will benefit from using SalesAFFIRMATION!, the ultimate tool for sales call preparation and self-critique that facilitates the 5 ELEMENTS that generate SalesENERGY! so you Don’t KILL the Sale Before You Show Up! Sales Pro Institute LLC offers Sales Coaching as part of the AffirmativeSELLING!™ program for Individual Performers, Sales Leaders, Teams and Business Management to “Up!” sales performance. Sales Leader Groups, Keynotes, Training Modules, one-on-one work: ask Therese for an opinion on what will solve your Sales problems. "It’s been said that ‘those who can, do and those who can’t, teach’. When it comes to selling, Therese Samudio does BOTH with passion and ease. She can really deliver a Keynote, inspire and move people to action. In the field, she’s a fearless closer. I’ve followed her brilliant work for years. When she works with you or your organization, you’ll be in most capable hands." Dianne Rentschler, National Sales Manager, HIG, Inc.
Therese will appear (keynote/workshop) for your event or meeting. Her material (customized for your needs) includes a variety of topics. Make Yourself Memorable: Who Are You and What Do You Do? Demo video of "make yourself memorable"
Achievements realized from Affirmative Selling™ offerings depend on many factors, including (but not limited to) the aptitude and cooperation of the Client, the business for which the Client works (or they own all or in part) and the Client’s staff. Therefore, it is understood that no specific or general warranty applies to education offered and/or work performed. Information gained and work performed by the Team(s) will be held in the strictest of confidence and will not be shared in any way without the Client’s consent. Copyright © 2017 SalesPro Institute LLC. All Rights Reserved.